Sixty-two projects and 90 students will be representing Southwest Kansas at the Kansas State Science and Engineering Fair in April. The projects were judged at the 10th annual Southwest Kansas Science and Engineering Fair at Seward County Community College on Saturday. 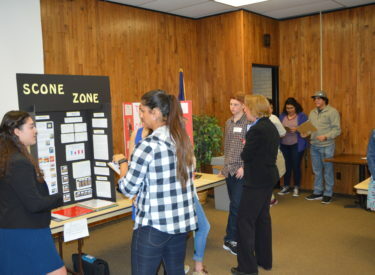 The one-day event, which covers 17 counties in Southwest Kansas, featured 83 science and engineering projects from 132 students. Elementary through high school grades from Rolla, Elkhart, Hugoton, Fowler, Sublette and Liberal participated. According to Dr. William Bryan, regional science fair director and SCCC chemistry instructor, this is the third largest group in the fair’s 10-year history. There were 20 categories each in three divisions and a separate division for third grade to pre-kindergarten. Not all categories had an entry. Each category had at least a gold medal winner, but the projects needed to meet a certain score to qualify for state. There were also three overall winners, one in each division, who received a plaque and a cash prize. Each project was evaluated by three different judges, who included faculty, staff and students from SCCC as well as area high school faculty. Each judge was assigned to their field of specialty. Over the 10 years, seven of the state overall finalists have come through this fair. Winners at the state level will move on to compete at the Intel International Science and Fair, which includes participants from all 50 states, the District of Columbia, and more than 75 countries, regions, and territories. The fair was originally created in 2008 as a part of a nine-district, state-wide competition through a grant from Spirit AeroSystems. Despite the grant expiring in 2010, the college continued to host the fair and absorbed all the costs, including the entrance fees to proceed to state. “Power by Algae” – Charlie Sheedy (Rolla High School, Morton County)- gold, state qualifier. “Spider-Man Cast” – Daniel Weatherly (Rolla High School, Morton County)-gold, state qualifier.